Welcome back to Red Pen Tidbits! We took a dive into three steps for using pronouns and antecedents correctly. I hope you’ve been practicing! This week, we’re focusing on commas with coordinating conjunctions. Don’t worry, I’ll try to make this as painless as possible! This post is also part of the Author Toolbox Blog Hop. Feel free to jump in with the link at the end of this post. 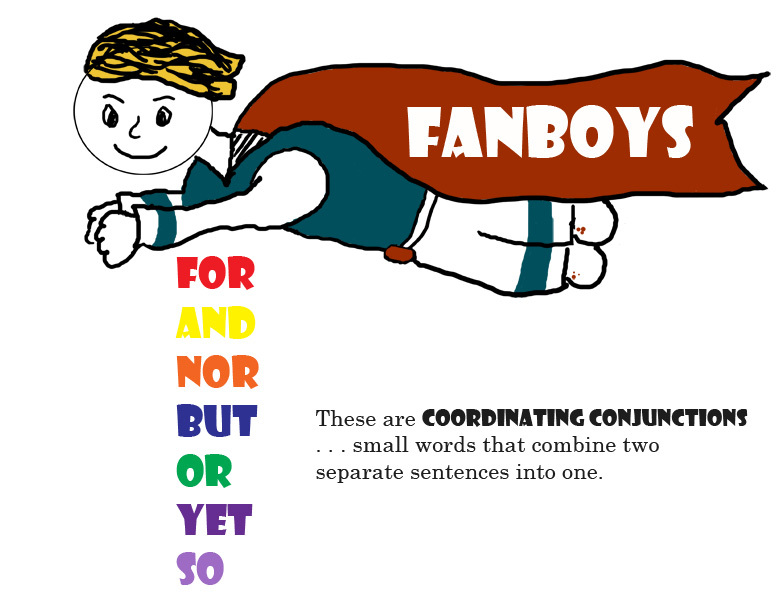 Even if you don’t remember what a coordinating conjunction is right away, I’m sure the acronym FANBOYS rings some far off bell. Right? Yes? Awesome! 1. Connecting compound subjects, predicates, and objects! As you know, compound simply means more than one. Subjects are doing the action in the sentence, and predicates contain the action in a sentence. Objects are receiving the action. Therefore, having a compound subject means you have more than one person doing the action. A compound predicate means you have more than one action in the sentence. A compound object means you have more than one person or object receiving the action. – Jackie and Annie want to read the same book. – Either all the extra books or the accumulation of scattered movies has got to go. – Jackie reads a book and imagines the scenes. – All of this is either going in the trash or getting donated. – Jackie wants a book and a magazine. – She’s one step away from junking either all the extra books or the accumulation of scattered movies. 2. Lists, lists, and more lists! Lists! Wait… You’re not talking about bullet points? A list can be found in pretty much any part of the sentence. Technically the compound pieces we looked at above are lists, but the examples I used only contained two things. This time we’ll look at what happens when you have three or more! The Rule: You combine the list with a coordinating conjunction. You’ll use a comma (called an Oxford Comma) before the conjunction at the end of a list. The controversy: There are many grammarians who believe you don’t need the Oxford Comma unless the meaning of the sentence would be unclear without it. I will let you know right now that I am definitely #TeamOxfordComma, but you choose what works best for you. – Jackie, Annie, and Sarah want to read the same book. – All the men, women, children,and pets were invited to the wedding. – Jackie reads a book, imagines the scenes,anddreams about castles. – All of this is going in the trash, getting donated,or vanishing with magic right now! – Jackie wants a book,a movie, and a magazine. Wait! Can I ever break this rule? I did tell you about the Oxford Comma controversy, so you decide if that counts as breaking that rule! In addition, some writers will use ‘and’ in place of all the commas if the character is excited about something and unwilling to take a breath. 3. Combining two complete sentences! Combining two complete sentences (better known as a compound sentence), allows you to join two similar thoughts in one. Notice the word similar! You don’t want to join two different sentences unless you’re contrasting something. The Rule: You combine these two sentences with a coordinating conjunction. You’ll use a comma before the conjunction to form the compound sentence. – Jackie read a book, and Sarah writes in her journal. – We were invited to the wedding, but our pets were not allowed. – Jackie put the book away, for she had already read it. – She wanted to through all of his junk away, so she did! Wait!! Can I ever break this rule? You didn’t hear this from me, but you can. Generally it’s broken in dialogue if your character is speaking quickly. Sometimes characters will even combine more than one complete sentence… EEK! Take out your trusty Writer’s Notebook, and open to the next blank page. Try out a few sentences using coordinating conjunctions and their lovely commas! Then, try using them in dialogue! Let me know how it goes in the comments below! I hope you’re ready for our next Red Pen Tidbit (August 2) about commonly confused words! Share with me in the comments below about your most frustrating grammar/usage errors. I will gladly address them in the future! If you need a bit more help after this tidbit, then please check out these other helpful sites. 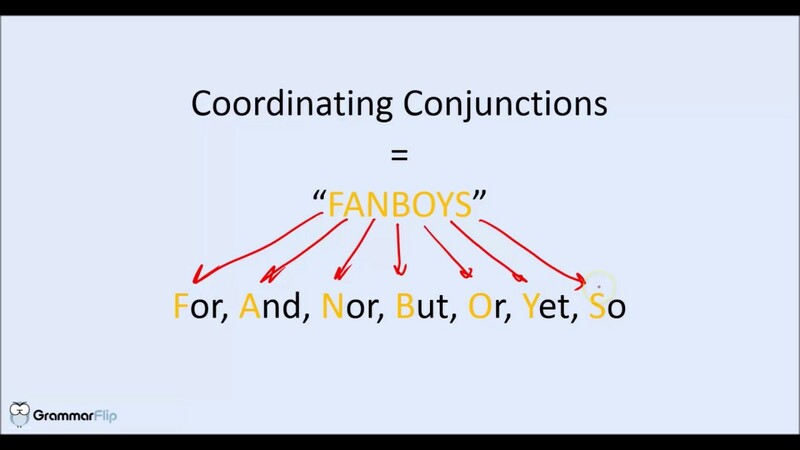 “The Coordinating Conjunction” via Grammar Bytes! My happy nerdy moment last week was reading a Facebook post on a page for editors when someone posted a trigger warning for not using the Oxford comma (because the piece she was editing was AP, which doesn’t use it). As you can guess, I’m #TeamOxfordComma as well. Great post! This made me smile. I started using FANBOYS years ago. I couldn’t come up with anything else. Now I can’t look at sentence without checking the punctuation around a coordinating conjunction. Thanks! Commas are killer, and knowing when to use them (or when to leave them out) is a struggle for sure. I once spent two months just studying the comma. I had a writing coach who advised me to work on it. I still make mistakes, but at least I understand the rules now. Two months! Totally worth the time, but I can see why you notice them all the time, now! I do, and it drives me crazy. There are so many comma rules that it’s hard for me to focus in on a few at a time! Ooh! Verb tenses will be a great topic in the future. Thank you for your feedback! Grammar is slowly becoming one of my favorite things! 👀🤔 Thanks for commenting! I totally got ripped off by going to a French school. No one ever told me anything about FANBOYS. So much easier to remember it that way. You’re so good at explaining all this stuff in an uncomplicated way! Thanks! This is great? Do you have more posts like this? If you click on the hyperlink in the first sentence, then that post links to all of them. 🙂 I forgot to link this one today, but I’ll add it when I get a chance. I post a new one every other week. Are there any topics you’d like me to cover? I am definitely up for any that relate to my series! I’ll look at the others and let you know. 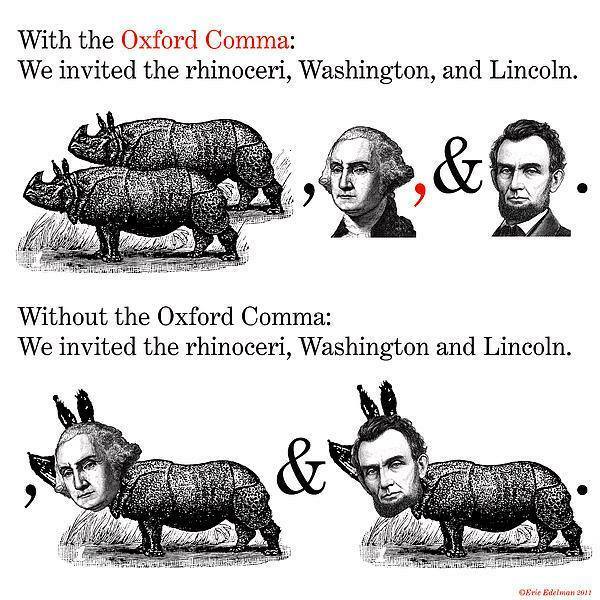 Like your red pen tidbits, and I’m a big fan of the Oxford Comma. I like the cut off your job!